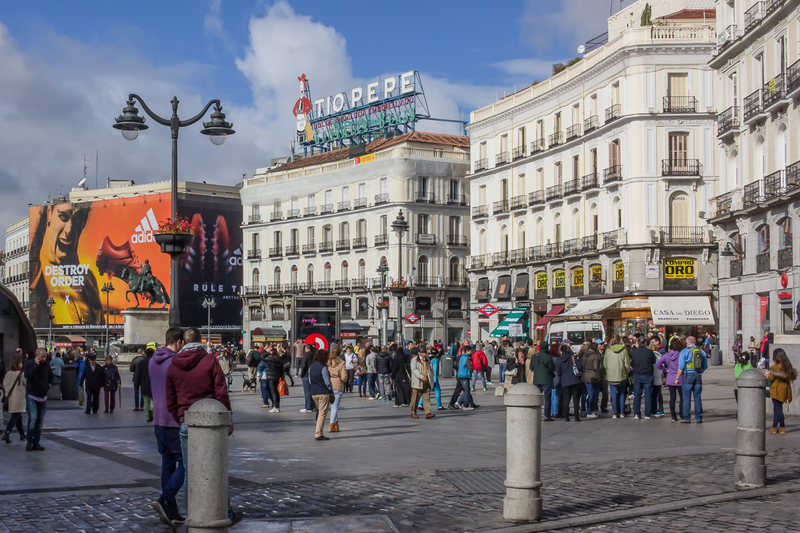 On the second day of our two-day visit to Madrid last Fall we took a walk from our hotel near El Retiro Park westward to Puerta del Sol, the city’s largest square. In this posting I’ll cover what we saw along the way. We followed a different path on the way back and that will be the subject of tomorrow’s posting. 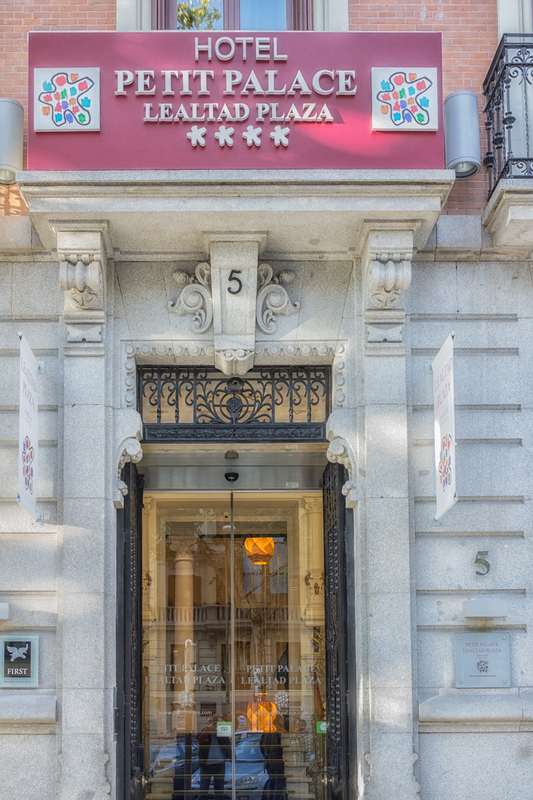 We stayed at the Petit Palace on Calle de Antonio Maura just above Lealtad Plaza. 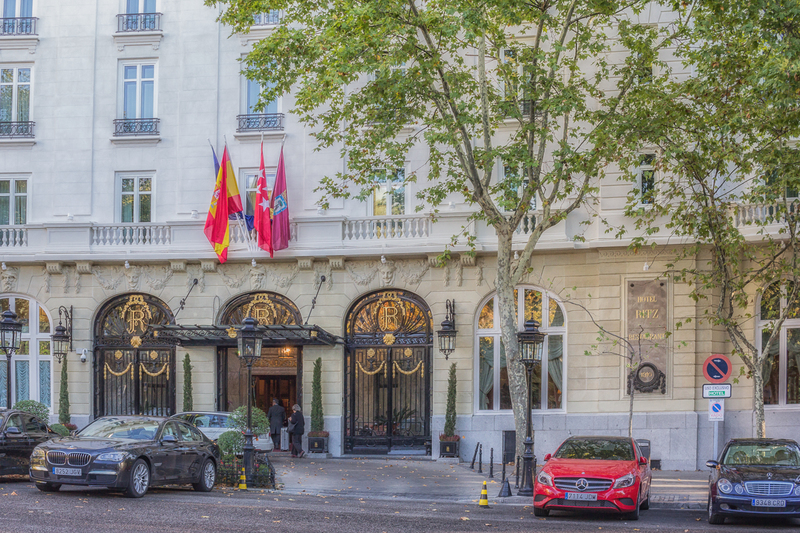 Our journey began at the Hotel Petit Palace on Calle de Antonio Maura a block east of Lealtad Plaza. 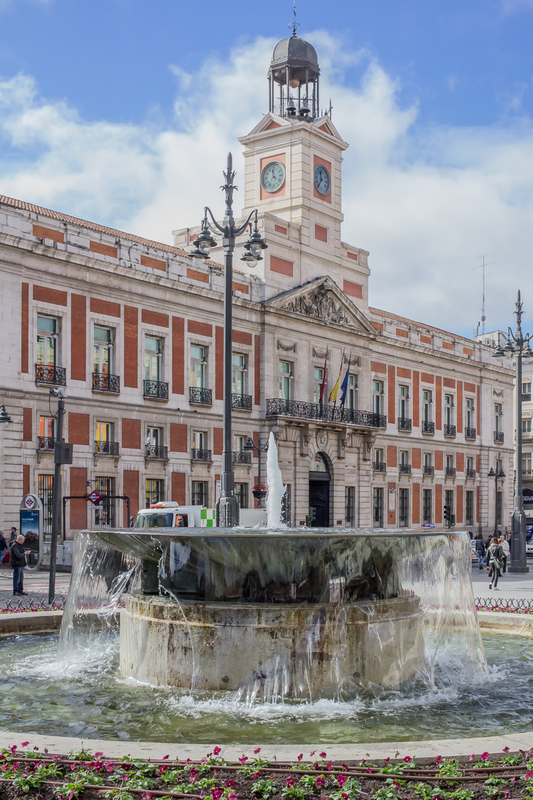 We then walked past the Ritz Hotel on Lealtad Plaza and crossed Paseo del Prado at Plaza de Canovas del Castillo, passing the Neptune Fountain on our left and the Thyssen on our right as we made our way to Plaza de las Cortes and then on to Carrera de San Jeronimo which we followed until we reached Puerta del Sol. The Ritz Hotel on Lealtad Plaza. 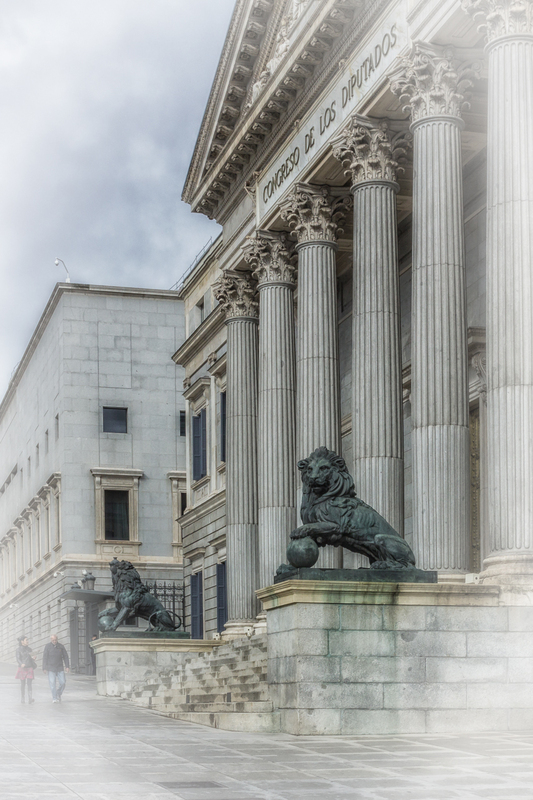 The Prado Museum is just south of the Ritz on Paseo del Prado. Neptune’s Fountain (Fuente de Neptuno) in Plaza de Canovas del Castillo which is in the middle of Paseo del Prado. Fans of Atletico de Madrid congregate here to celebrate their team’s victories. The Congreso de los Diputados is similar to our House of Representatives. 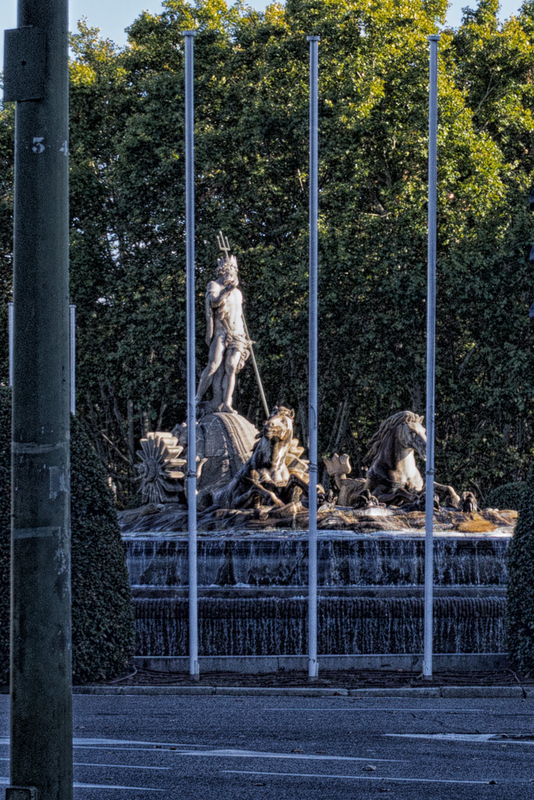 The two lions are directly opposite Plaza de las Cortes. 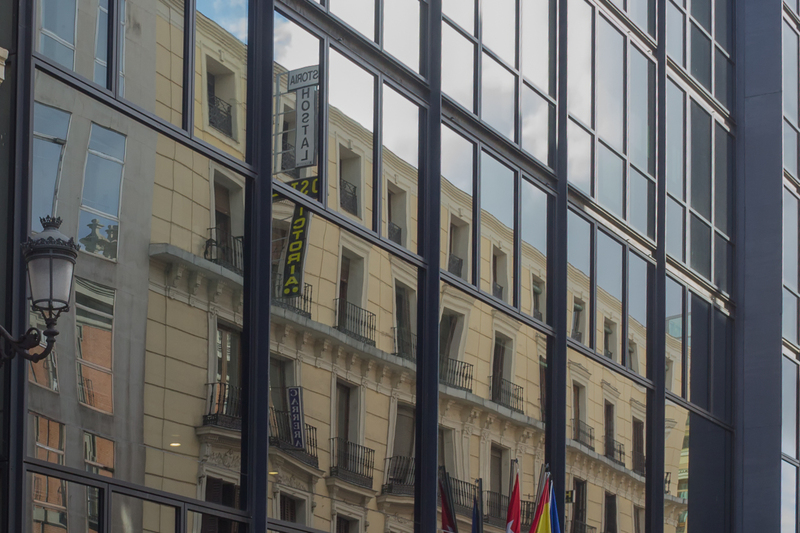 Reflection of another building on Carrera de San Jeronimo. 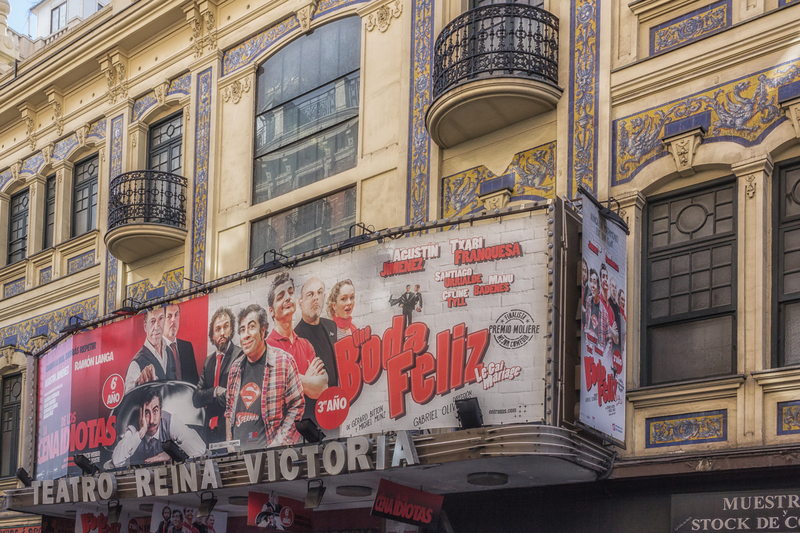 The Teatro Reina Victoria on Carrera de San Jeronimo. It’s a popular theatre that holds about 600 people. 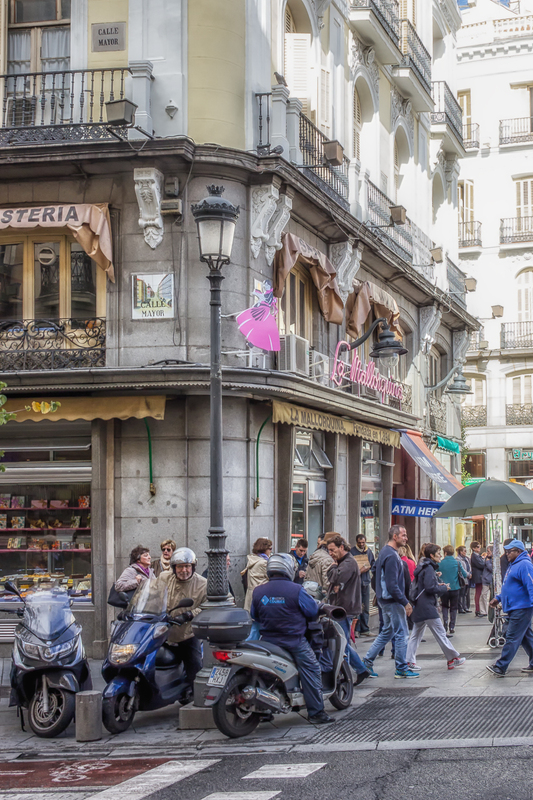 Carrera de San Jeronimo is one of ten streets that lead to Plaza de la Puerta del Sol, the heart of the city. It’s also considered the center of Spain and a plaque just outside the House of the Post Office marks Kilometre Zero, the heart of the nation’s roads, from which all distances to and from Madrid are measured. Puerta del Sol (Gate of the Sun). 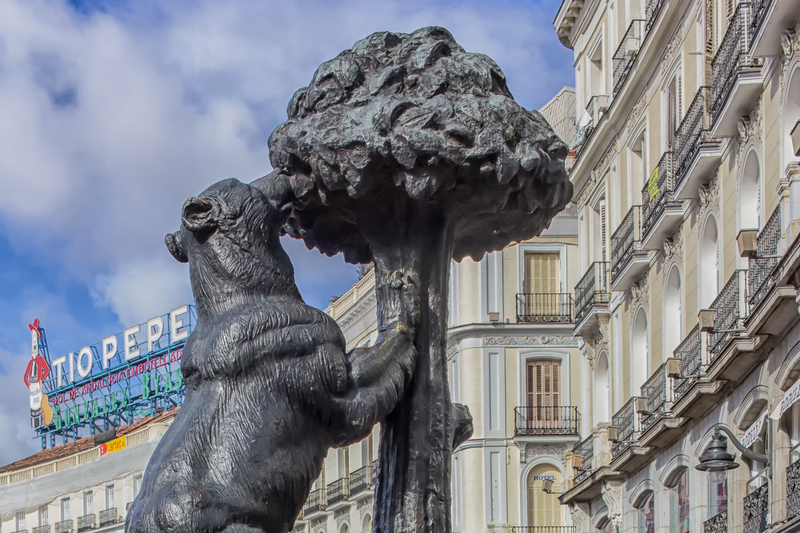 The Bear and the Madrone tree (El Oso y El Madrono) is the official symbol of the city of Madrid. The statue was made in 1967 by Antonio Navarro Santa Fe. Tio Pepe is the famous brand of sherry from Jerez in southwest Spain. 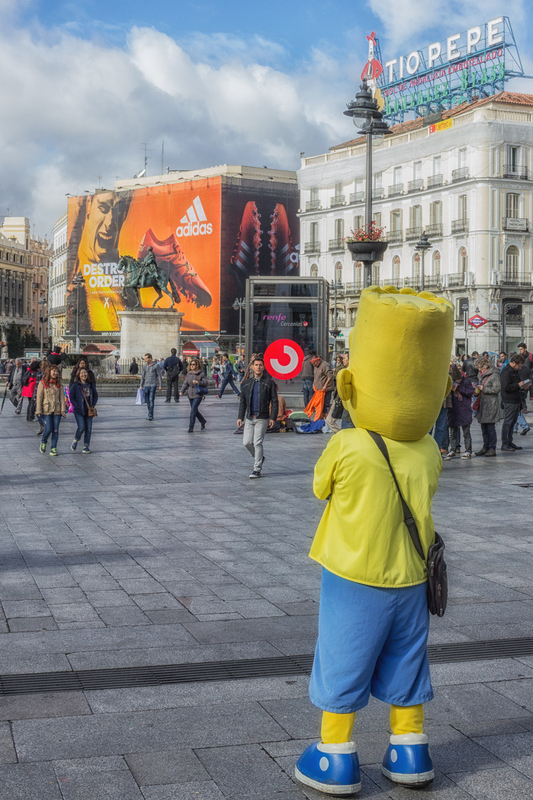 Homer Simpson greets visitors to Puerta del Sol. The old House of the Post Office (Casa de Correos) now houses the office of the President of the Community of Madrid. 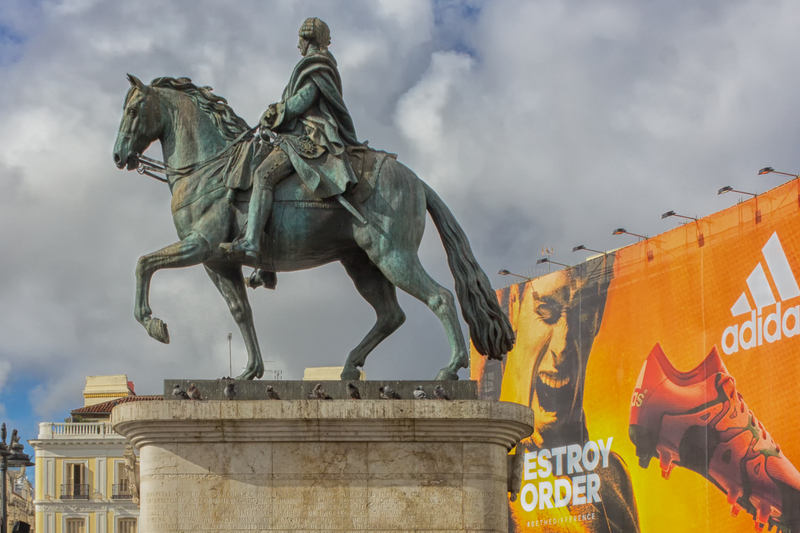 King Charles III rides above the middle of the square. 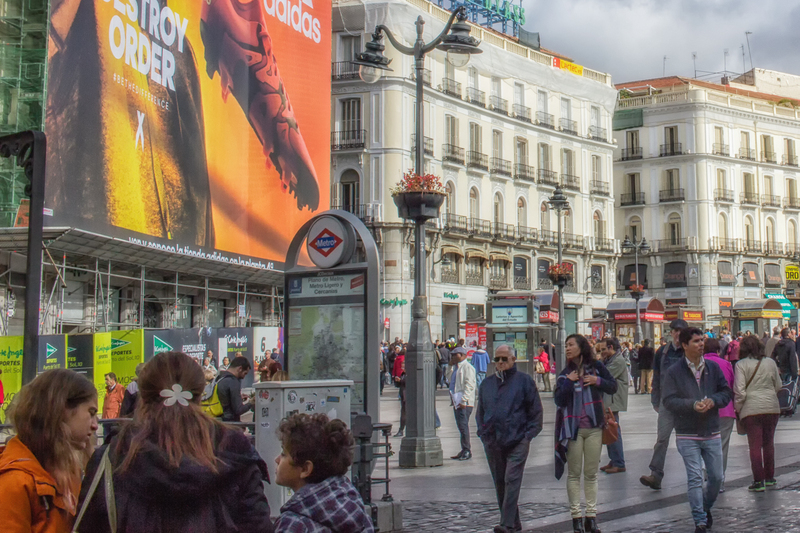 That big billboard was selling a local beer when we first visited Puerta del Sol five years ago. 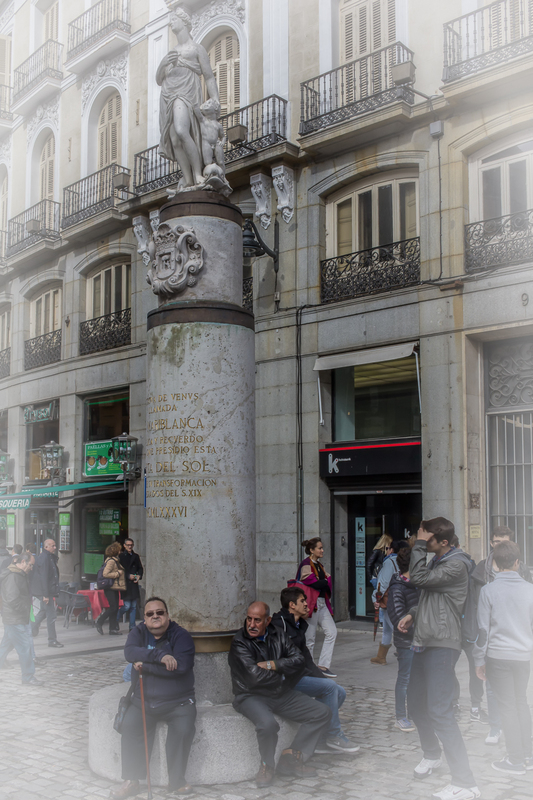 Replica of the Mariblanca statue that used to stand in Puerta del Sol in the 19th century. Calle del Arenal is one of ten Puerta del Sol spokes. This street heads in a northwesterly direction toward Plaza Isabel II. You can catch lines 1, 2 and 3 of the Madrid Metro here at Puerta del Sol. 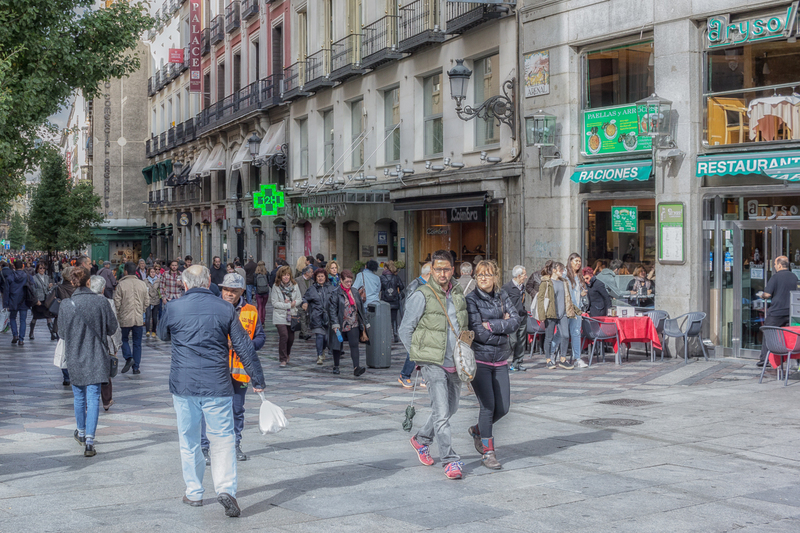 Calle Mayor is on the western edge of Puerta del Sol. Plaza Mayor is a few blocks further west. We encountered several more plazas on our way back to our hotel. I’ll show you photos from this part of our walk tomorrow in my next posting.
. . . I think that’s Bart . . . Homer has a different look.